With her old oven (a Thermador), you would have to bake just about everything for 10-15 minutes longer than what the recipe called for. Apparently one of the heating elements was broken. One time we were baking a cobbler and another heating element sent sparks flying. We had to throw the cobbler away for fear we would eat metal or something that was sharp! 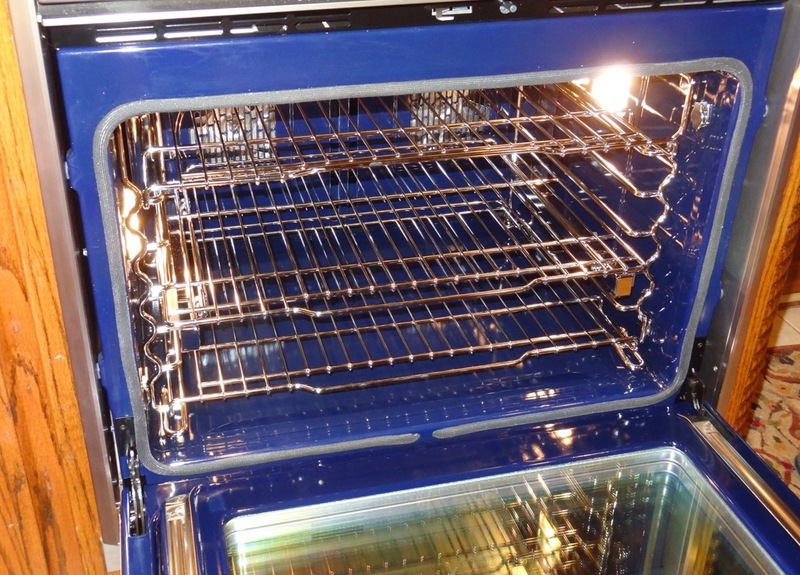 Another time, the numbers (timer, bake time, clock) wouldn’t show up on the oven….the list goes on. Instead of calling out the repairman for what seemed like the tenth time in just a matter of years, my parents just ordered a new oven. It’s pretty high-tech and mom is super excited. For one, the inside is cobalt blue. Second, it has a DUAL convection system – a convection system is different from the conventional one because it has a fan and cooks the food much more evenly. There’s also ten cooking modes – bake, broil, etc. (the usuals) plus the ability to proof bread and dehydrate fruit! 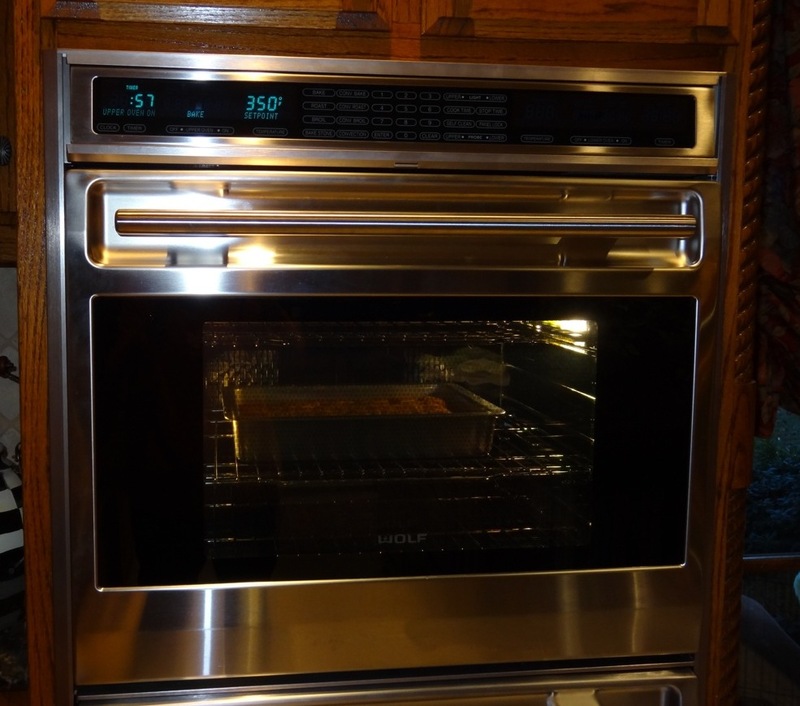 Mom was also excited about the temperature probe, and the easy to glide oven racks. Christening the oven with a batch of blondies. Mmm…mmm good! With the new oven installed it was time to bake something! Brownies, cookies and bars are some of our favorite things to bake, so mom pulled out Ina Garten’s newest cookbook, Barefoot Contessa Foolproof: Recipes You Can Trust, and whipped up a batch of delicious chocolate chunk blondies. The blondies were absolutely AMAZING! You can guess from the name that a blondie is pretty much a blonde brownie. Instead of cocoa or chocolate, a blondie is based on brown sugar. Many times they include chocolate chips or chunks. These remind me of a super-thick cookie cake! 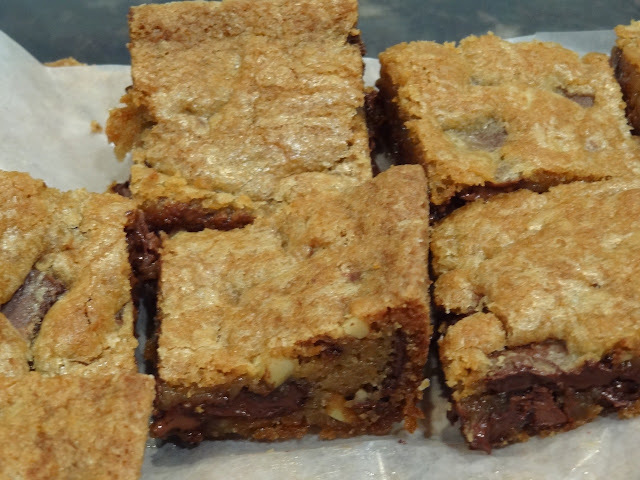 They are so moist, the chocolate chunks are perfect in size & taste, and the walnuts add a nice crunch. By far, these are the BEST blondies I’ve ever eaten! 1. Preheat the oven to 350 degrees F. Grease and flour a 8 x 12 x 12-inch pan (we used a 9 x 13-inch pan). 2. In the bowl of an electric mixer fitted with the paddle attachment, cream the butter, brown sugar, and granulated sugar on high speed for 3 minutes, until light and fluffy. With the mixer on low, add the vanilla, then the eggs, one at a time, and mix well, scraping down the bowl. 3. In a small bowl, sift together the flour, baking soda and salt and the mixer still on low, slowly add flour mixture to the butter mixture. Fold the walnuts and chocolate chunks in with a rubber spatula. 4. Spread the batter into the prepared pan and smooth the top. Bake for 30 minutes exactly. Don’t over bake! A toothpick may not come out clean. Cool completely in the pan and cut into bars.